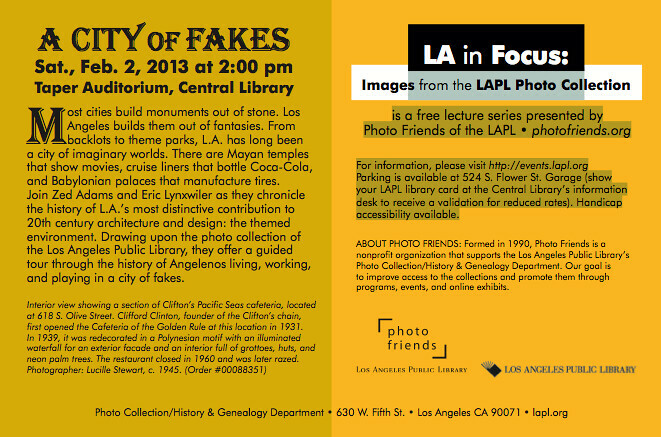 Venice to be Featured at 'City of Fakes' Lecture - Yo! Venice! Zed Adams and Eric Lynxwiler will be giving a free lecture at the Taper Auditorium at the Central Library downtown on Saturday, February 2nd, discussing the history of themed environments in Los Angeles. Venice Beach will play a prominent role in the discussion. Most cities build monuments out of stone. Los Angeles builds them out of fantasies. From backlots to theme parks, L.A. has long been a city of imaginary worlds. There are Mayan temples that show movies, cruise liners that bottle Coca-Cola, and Babylonian palaces that manufacture tires. Join Zed Adams and Eric Lynxwiler as they chronicle the history of L.A.’s most distinctive contribution to 20th century architecture and design: the themed environment. Drawing upon the photo collection of the Los Angeles Public Library, they offer a guided tour through the history of Angelenos living, working, and playing in a city of fakes. Parking is available at 524 S. Flower St. Garage (show your LAPL library card at the Central Library’s information desk to receive a validation for reduced rates). Handicap accessibility available.